About | Robbie's Blog Adventures! or trapped in the basement, all he needs is a little creativity and resourcefulness, and he is off on one of Robbie’s Big Adventures. Come along with him! 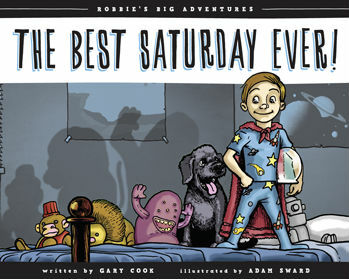 The first book of Robbie’s Big Adventures! On a rainy Saturday, the power goes out. With no TV and no chance of going outside, Robbie wonders how he could possibly have fun. He’ll just have to make it up! Using only his imagination, Robbie manages to save a city from a terrifying monster, captain a space shuttle, and tame a fearsome lion as the ringmaster of a circus. With all these adventures, will he even notice when the rain stops and the lights come back on? Through entertaining rhymes and exciting graphic novel-style illustrations, this book will remind kids of the power of their own imaginations, and prove that rain — and a lack of power — just might make for THE BEST SATURDAY EVER! Did you know Robbie has a website? Check it out and follow Robbie on all his adventures!